With Computer Science Education Week upon us, we invite students and educators to answer this global call to action: spend just an hour learning the basics of coding, through the Hour of Code, and start growing the skills that will be critical for years to come. Coding and creativity co-exist in Minecraft: Education Edition, which is why we created a brand new tutorial for it, “Hero’s Journey,” to help kickstart your computer science journey. You can learn more about how it works, and how to download it, in this Education Blog post from Deirdre Quarnstrom, Minecraft Education general manager. Try out our new Minecraft: Education Edition tutorial, Hero’s Journey. Visit your local Microsoft Store for a hands-on experience. All Microsoft Store locations are hosting free Hour of Code workshops featuring the new Minecraft: Education Edition tutorial, as well as the Computer Science for Everyone workshop series for educators and parents at all coding levels. 4-H youth volunteers will support Hour of Code events with students and teachers from Lincoln Elementary in Green Bay, and Kindred Elementary in Kindred, North Dakota. The North Dakota event will be attended by Governor Doug Burgum, who is a leader in promoting STEM education. These events come on the heels of the announcement of TechSpark, a civic program recently launched by Microsoft, that aims to foster greater economic opportunity and job creation in rural communities. That work includes broadening access to computer science education. Microsoft will host two Hour of Code events with Technology Education and Literacy in Schools (TEALS). TEALS is an industry-wide pro-bono program that taps computer scientists to team-teach (with in-class teachers) fundamental and advanced placement computer science to high school students. TEALS students from Quincy, Washington, will join Seattle Seahawk Luke Willson at the Microsoft Store at Bellevue Square Mall as he takes younger students through an Hour of Code. In Mecklenburg County, Virginia, TEALS students and volunteers from Bluestone High School will coach students from Bluestone Middle School through an Hour of Code. In Boston, we will celebrate a partnership with Resilient Coders, a nonprofit based in Boston that teaches underserved and at-risk,young people to code. This year, Pariss Chandler, who learned to code over just eight weeks and recently landed a developer position at a local organization, will return to Amigos Elementary, the bilingual elementary school she attended in Cambridge, Massachusetts, to lead an Hour of Code and inspire the next generation to learn computer science skills essential in today’s job market. In addition to these partnered events, Microsoft is hosting an Hour of Code event with 14 Detroit middle schools participating in virtual and in-person sessions, all to compete for a chance to participate in an exclusive event at the Microsoft Technology Center. The winners will join Microsoft and student volunteers from the Detroit International Academy for Young Women (DIA), a local Microsoft TEALS high school, for an Hour of Code on Friday, December 8, to inspire students to pursue a career in the industry and develop skills essential in today’s digital economy. The in-person event will be hosted by Detroit native Charles “Stacy” Harris, an app development architect for Microsoft, who first learned how to code by teaching himself from a book his father bought at Radio Shack (pictured on the right). And in New York, Jets wide receiver Jermaine Kearse will co-host an Hour of Code workshop at the flagship Microsoft Store in New York and interact with kids from the Jermaine Kearse Foundation 15 to 1, which supports youth in military families. 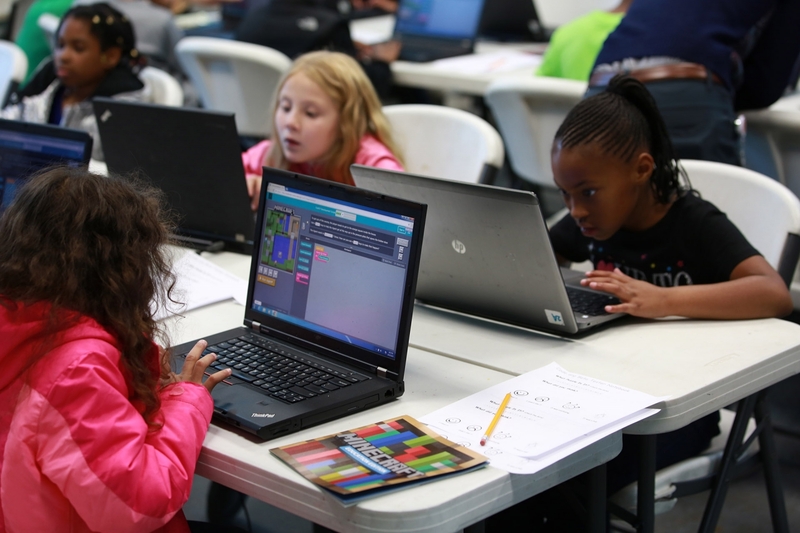 It’s an economic and moral imperative to ensure our students are equipped with computer science skills, which includes coding, computational thinking, and logic. Please join Microsoft in building a global appreciation for Computer Science by visiting Code.org and doing your very own Hour of Code today.